One of the most famous comics-series is now brought to gamblers in its best form and we can only thank Playtech and Marvel. Enjoy amazing features in a Marvel slot - great example of free online slots. If you have seen the X-men movie, you'll be glad to see your favourite heroes again. There are no symbols that gamblers are used to – only images of the comics' characters and entourage. Face Professor X, Raven, Magneto, Juggernaut and others. Find out what the ;Wild logo is capable as a wild symbol. But don't forget that wild symbols can't take place of scatter ones in order to complete winning combinations, it's alright with any other other symbol except “X-men” logo. Fans of curious features will be pleased to see what happens when 5 symbols of any X-men shape the letter your bet is multiplied by 5. 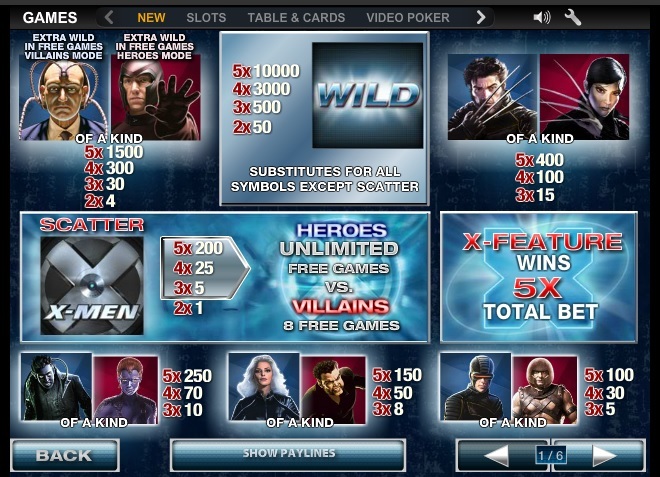 If you receive 3 or more X-menlogos on the lines, that will trigger the main bonus game. You start it in the heroes mode and enjoy free spins until the villains mode is triggered by Magneto's icon landing on the third reel. But that's not so bad either – there are still 8 free spins waiting for you. If you don't want to get back to the main game yet and keep taking free spins, then hope for Professor X to appear sooner on the third reel and take you back to the heroes mode. What is a slot without a jackpot? When it comes to Marvel, questions like that can be answered only by asking another one: what is a jackpot if it's not Marvel's progressive? This is the best concept of jackpots ever: Power, Extra Power, Super Power and Absolute Power – 4 levels, 4 chances to get lucky as easy as it has never been before. So, enjoy gambling X-Men slot machine.